And they've never looked better! Now the striped ones can compete with their 'regiomonteño' archrivals, Tigres, who recently got kitted out by Nike's arch-nemesis - adidas. This is a huge step up for north Mexico club, who were previously outfitted by local manufacturer Atletica, and suddenly see themselves as the second team in the Mexican top-flight to have a Swoosh on their shirts. 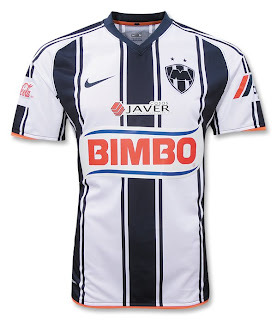 The first of course, is the richest team in Mexico - América.